Imriel de la Courcel's birth parents are history's most reviled traitors, but his adoptive parents, the Comtesse Phedre and the warrior-priest Joscelin, are Terre d'Ange's greatest champions. Stolen, tortured, and enslaved as a young boy, Imriel is now a Prince of the Blood; third in line for the throne in a land that revels in art, beauty and desire. It is a court steeped in deeply laid conspiracies - and there are many who would see the young prince dead. Some despise him out of hatred for his mother, Melisande, who nearly destroyed the entire realm in her quest for power. Others because they fear he has inherited his mother's irresistible allure - and her dangerous gifts. The story builds slowly, and it probably helps to have read the first three books in the series, but the last three can stand on their own. The characters are interesting, and the story is fun to follow. It's also deeply frustrating, because it leaves off so you have to read the next book. These shouldn't be read if you embarrass easily. There is some serious adult content. If that doesn't bother you, then the world the author creates is interesting, and you'll be left wanting to know how things turn out. I have read 5 of the 6 books in this series. This one provides the basis for Emriel, who goes on to be the major character in the next three books. The rest of it wasn't what I cared for, but necessary for the plot structure. If you're into plot, character development, intrigue and a great basis for alternate history this series is totally what you're looking for. I really started to understand the "Love as Thou Wilt" precept. Moral ambiguity set aside, Carey managed to develop an entirely different universe with Terre D'ange. It is a great story that's hard to put down. i really enjoyed this story. i'm still having trouble with the narrator but not enough to take away from the story. i understand the reasoning for the change in narrators but i don't care for the male narrators interpretation of the voices of many of the characters. but again Jacqueline Carey's writing is what saves the story. to the narrator you seem to have made many of the characters sound very old. I listened to the first three Kushiel's books on audible and thought they were fantastic. I gave up on this one and purchased the Kindle version. The narrator selected was totally wrong for this book. Instead of sounding like Imri, a young teenager, he sounds like a grandpa recalling something from the distant past. He takes the vibrant young characters like the Queen who are clearly in their 30s and makes them sound like elderly British monarchs. His pronouciations were also completely inconsistent with the first narrator, which was jarring. I think this narrator would be fine for different material, but not this series. I am looking forward to picking this up in book form. 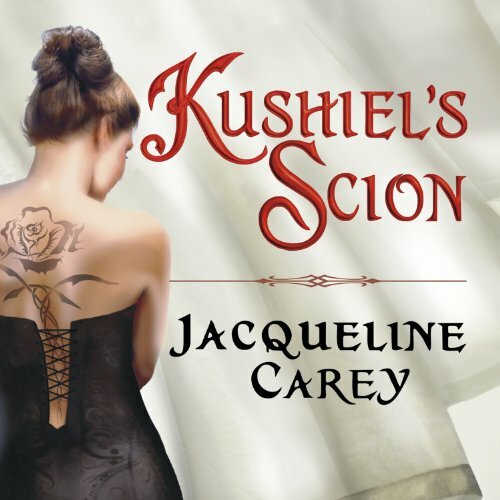 What made the experience of listening to Kushiel's Scion the most enjoyable? I love this series. I really enjoy the plot and intrigue and characters. If I hadn't read this book before listening to it I wouldn't have liked it I don't think and all because of the narration done by Vance. What didn’t you like about Simon Vance’s performance? Simon Vance doesn't do this author justice at all. After listening to this story from a woman's point of view over the last 3 books it is natural to find some adjustments going to a male narration, but he can't pronounce half the names, titles and places correct and his inflections for each character are totally bazar. Having a lot of trouble getting through this book. Wish he would have stayed closer to the other narrations. I started this after the Kushiel's Dart series, so I knew that the voices would be different in this new series with a new narrator. But the narrator adopts a very bad french accents and pronunciation during the names of characters and places. Especially with the names that end in "dre" - Isondre, Pheadre, etc. I do understand that Terre D'Ange is imagined to geographically be in France, but those names sound so uncomfortable. I wince whenever the text uses those words. It sounds like he's trying to roll the "r" but doesn't get there and sounds sort of muffled instead. Additionally, the dialogue is read half in a french accent and half not, not always consistent with the characters. This is a good book, and fairly well narrated, except that the voices of the "Tiberians" all sound like Transylvanian vampires. ( This is NOT a vampire book) I found it wildly distracting. The earlier books in the series which feature Phaedre and Jocelyn are much more interesting, but the horribly pedantic narrator of those books ruined things for me. I couldn't even listen to the whole preview(I tried, I really tried), so I settled for the better of two narrators from a series I really love. Read the books instead- and make up your own voices. Great adventures and tales of Imriel's coming to manhood. Loved the writing. The audio performance was professional, and on matters of timing, emotive conviction, and pace, he did a great job. For a straight reading, this actor would be just fine. If he had not attempted any accents, I might give him four stars. Good job on the ghost, Gladius, but many others were cardboard impressions of the characters that I found to be distracting, and at times even irritating. I do not feel he truly connected with the characters, so they felt forced.